Cargo Pants for men. Cargo pants have been used as an outfit by British military, and taking the influence from them, the cargo pants have made their way to mainstream fashion. Be it men or women, they wear cargo pants for various events, or for casual outings. In short, cargo pants can be easily pulled off in many ways. With the passage of time cargo pants have been altered as compared to the typical military dress, they have become slimmer and also they have smaller pockets as compared to the past. The modification is amazing as now men can wear cargo pants for multiple events and can look different with varying styles. 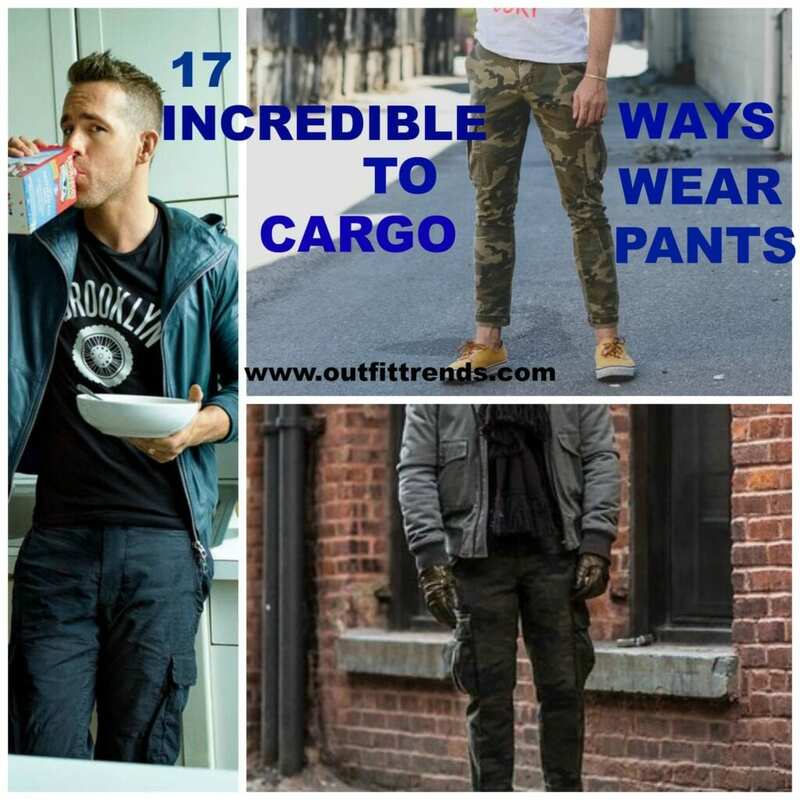 Men may think that cargo pants are just for casual wear, well we have 17 amazing outfit styles that men can opt for, so this way cargo pants can be worn for every sort of event. Summer calls for outfits which are light and breathable, not only this you want to wear outfits which make you feel fresh. You can totally pull off cargo pants in summers, especially with some light colored tee shirts or polo shirts. These can be combined with sneakers to give a complete look. Cargo pants are also used for rough and tough purposes, so if you plan to go on a hike than wear your cargo pants, with hiking boots. The entire look can be complemented with a jacket and a tee shirt. This dress code is ideal for outdoor activities as it will not only be comfortable but also add style to your persona. Winter means a lot of layering and clothing, so you can also do a lot of addition and subtraction to the way you dress. If you want to wear cargo pants in winter, you can wear it with a button-down shirt and combined with a sweater. This gives a professional as well as very toned down look. It is always easy and best to keep yourself simple and look trendy. Combine your cargo pants with a plain tee and cardigan. This look is ideal for casual outing with friends or even when you are off to pick up your lady from any place. You will set a simple yet an attractive bar for others. It is usually considered that cargo pants are only feasible for casual looks, well you can prove people wrong as you can totally pull off a gentleman look by wearing a khaki colored cargo pant with coat and even a hat will compliment the entire outfit. This is ideal for offices or formal events. Cargo pants will even be great for your everyday school or university look. Whether bright or light colored, these can be worn with multiple kinds of tops, from tee shirts to formal button down shirts. For footwear, you can wear sneakers, dress shoes or whatever your dress code adjusts in well. Mufflers, coats, colorful sweaters are winter essentials, but you can add cargo pants to the list as well. These are comfortable and you can wear them to school everyday without the worry of deciding what to wear. A great way to look super chill out and casual in cargo pants is to combine them with a tee shirt or button down shirt and wear sneakers. This look is not at all high maintenance and can is to carry at most of the places, be it hanging out with friends or simply going to do groceries. Vacations means a lot of traveling and a dress code which will allow you to do all the fun activities. Since you must not carry an abundance of luggage always carry your cargo pants as you can combine and contrast them with various options and these will be perfect for hikes and excess outdoor traveling. Every girl’s favorite and every boy’s ideal, Ryan Reynolds casually carries his grey cargo pants at home. You can too opt for this style as this is simple and very attractive. Weekend means a lot of comfort time and comfort dresses. Cargo pants with a simple plain striped tee is one of the most ideal ways to look effortlessly classy even on weekends. This is an instant ready to go out look, which is a plus. Wear flip-flops to compliment the whole look. Denim can be combined with anything, so why not with cargo pants? You can wear a button-down denim shirt and combine it with a leather jacket. This is an instant and easy dressed up look for hangouts or instantly planned outings. Enrique Iglesias is a style icon for many, and men can take a great benefit and inspiration from his sense of style. Like this handsome guy, you can also carry cargo pants with a cardigan to a formal event with more confidence. Denim is the easiest solution, a denim cargo pant can be style in a trillion ways. A simple yet sophisticated look can include combining it with a button down shirt and a cardigan or sweater.